Registered Childminder of 20 years, with two children, 21 & 16 years. I love my job and have received two Outstandings and a Good grades from Ofsted with lots of positive references from past and present parents. I have Wednesday’s & Thursday’s available, 0-3 years. I provide a high quality, affordable childcare in a relaxed and caring home environment. I take the children to local Children's Centres each week to socialise with other children and attend lots of trips together, to learn about children's communities and environments, as well as having fun; these include, farms, parks, fruit/veg picking, Fire Station visits, cinema, bowling, library and even the seaside. I encourage the children to become independent, which builds on their self-esteem and confidence, which helps their development improve further. The children join in with a variety of activites, including lots of crafts (painting, cutting/glueing, playdough, cooking) and following themes and festivals throughout the year. I have a good sized play room with many toys, educational toys, role play, kitchen, DIY work bench and puzzles as well as a garden with many outside bikes, toys and sand/water play. Look forward to hearing from you and meeting you very soon. 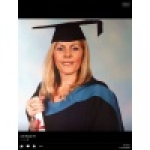 I have a Foundation Degree in Early Years with the Open University and am a member of the Professional Association for Childcare and Early Years (PACEY, formally NCMA). As a childminder I have looked after many children, including siblings and children with Special Educational Needs. I follow the Early Years Foundation Stage framework, where the children have their own individual folders with photos, reminders of their achievements and activities they have undertaken in my care. Please look at my reviews from present/previous minded parents, as well as lots of references in my portfolio, when you come to visit. Below are the latest reviews for Julie Nangle. Please note that reviews represent the subjective opinions of other Childcare.co.uk users and not of Childcare.co.uk. Parents must carry out their own checks and references on childcare providers to ensure that they are completely happy before enaging in the use of their services. This lady is the gem of the ocean! Julie is so professional and organised. My grandson absolutely adores her not once have I had tears at drop off not even on day 1!! I work in a job where I needed a childminder who could on occasions be accommodating Julie has met my every need. Thank you so much for your beautiful words Rosemary! Julie has been having my son 2 days a week now since January 2017. I love her as does my 14 month old son. I am thrilled how well the arrangement is going. And couldn't wish for a better childminder. He adores smokey (Julie's cat) who is ever so good with children and allows my son to play and stoke him (and even follow him around). Love you both too and look forward to when he comes each week. Julie Cared for my 2 daughters, 2 days a week, for 2 years. Both girls were extremely happy and settled in Julie's care. My youngest daughter, having cried non-stop every day for weeks at her previous childminder, was instantly calm and happy with Julie from her very first day - quite a transformation! Julie's setting is spacious, clean and tidy, providing a lovely calm environment for the children. She has a large number of toys, games and books, suitable for varying ages. She encourages the children to tidy up after themselves, helping install good habits. She is always engaging the children in imaginative art and craft, cooking etc., projects, often timely for festivals, world events etc. My girls loved doing these and were always very proud of their work. It is also great that they are learning about cultures, history and the environment at the same time. Julie takes the children to various groups on a regular basis where they are able to play with other children. She also often takes them on various outings. They have enjoyed trips to museums, parks, farms, the fire station amongst others. They always have a great time on these trips and I am very confident with how well they were being looked after. The girls always came home on a full stomach having enjoyed a nutritious home-cooked meal that Julie had prepared for them. I am extremely happy with the way my daughters have been cared for by Julie and would not hesitate to recommend her to other parents. I am so glad your girls enjoyed themselves in my setting and still miss them coming here. I'm sure I'll see them again soon, perhaps in the school holidays. Julie has been our childminder for two years now ever since our son was nearly two. Julie is an extremely patient and organised person who has always tried her best to accommodate our needs. Our son has quickly created an amazing bond with her and enjoyed every day at her setting, this is also because Julie is very creative with her activities both indoor and outdoor. Julie is excellent in describing activities she has done with our son during the day and if any accidents occur as well. She also kept us up to date during the day by sending us pictures via text so we don't miss those precious moments. Our son is also very keen on her, always asking if he'll be seeing Julie today and always looks forward to when he will be seeing her next. She has created a very special bond with our son and for this we are truly grateful for. I would like to thank you for an amazing two years that you have been in our son's life and of course we are extremely grateful for your flexibility to help us when we were in need. We have never had an issues with you and because of this you have made our lives a lot easier and stress free as first time parents. We will be more than happy to be contacted to provide a reference. Thank you for your lovely review, very much appreciated. I will miss him and hope he enjoys his new adventure! Just wanted to leave a review for Julie for anyone looking to use her services. Julie was my daughters first childminder when I went back to work and was great at reassuring me my daughter would be fine while I was gone, the first few weeks she sent me lots of photos and updates during the day which really helped me with the settling in. My daughter was very happy at Julie's and came on really well. Julie is very friendly and easy to get on with and has a lovely home with great toys for the children to play with while they were at home. Thank you Abi for your lovely review. Your daughter was a joy to have and we all miss her coming here. Let me know if you need my services again.